Yesterday my mother told her friends that I was rich. My little daughter had said to her that 'mummy was making pancakes', which she translated as 'mummy is making packets.' !! Mix/beat ingredients together and add milk till mixture is runny enough to pour off the end of spoon slowly. In a frying pan (traditional Scots would use a skillet) smear butter and leave pan till quite hot (med-high heat). Pour in pancake and leave till all bubbles rise and burst. Turn over and cook till brown. 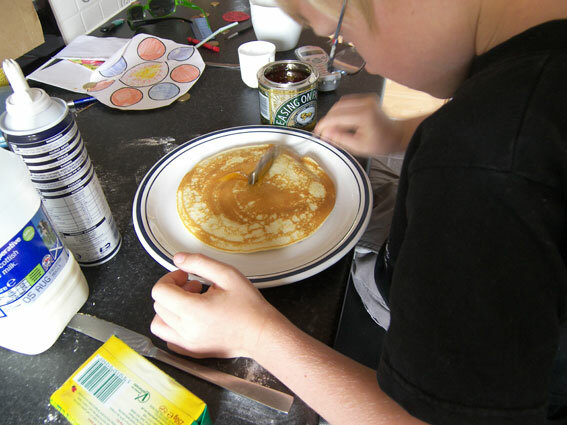 If the pancake is pale when it is turned then the heat is not high enough.